Enjoy relaxing onThe Better Homes and Gardens Colebrook Chaise Lounge Chair. This attractive chaise lounge features four back positions, a frame made from steel and covered in all-weather wicker and wheels for easy mobility. Cushions are included. Cushion fabric is UV-treated, water, mildew and stain resistant. Look for other beautiful, coordinating Colebrook Collection pieces. Note: steel and wrought iron are not warranted for rust, corrosion, or rust staining. Fading, mildew and discoloration due to exposure to elements, chemicals and spills are not covered. Please refer to care and maintenance information for proper cleaning instructions. Site to Store Pickup Note: This item is packaged in 1 large box that may not fit in a standard-sized vehicle. Please make sure you have a large car or truck for store pickup. Well, designed, easy to assemble, luxurious pad! I really like our Colebrook Chaise Lounge. Its well, designed and was easy to assemble, with very clear and detailed instructions. The pad is thick and luxurious, the wheels are big making it easy to move around, and the overall design is attractive and easy to live with. It feels quite solid in steel and the faux webbing is quite attractive. It arrived very carefully packaged. All the nuts and bolts were bubble-wrapped, and everything was in its own plastic wrapping. Unfortunately, the pad on our unit arrived with an oil stain in a prominent place. Their customer service was excellent with clear menus and a minimal wait time. Anita the customer service rep was courteous, efficient, understanding and helpful. Looks to me like it's the same as the Azalea chaise but with wheels added. Great value! I bought two of these along with two rockers and the three seat couch for my large front porch. I have received everything but the couch so far. These were really easy to assemble and have really nice large cushions. They are very sturdy and the wheels make them easy to move. I am very pleased with them so far! The chaise lounger is the perfect fit for my screened in back porch. This cushion and adjustable back makes it a great addition. 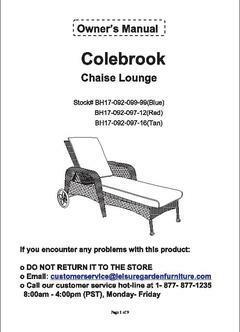 Can the 'Colebrook chaise lounge lay flat ? How much does the chaise lounge weigh -in pkg and after assembly? 1. 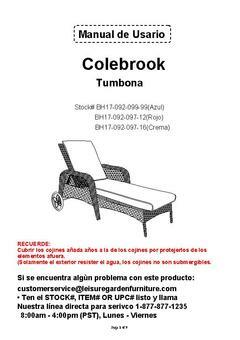 Thank you for your interest in the Colebrook Chaise Lounge Chair. The chaise does not lay completely flat. It weighs 44.51 lbs and with packaging, 53.75 lbs. If you have further questions; feel free to contact us via email at: customerservice@leisuregardenfurniture.com or call us at 1-877-877-1235 (8:00am – 4:00pm PST Monday-Friday). Is this specific cushion in blue sold separately? If so where can I locate it on the site? 1. Please contact us directly regarding replacement cushions via email at: customerservice@leisuregardenfurniture.com or call us at 1-877-877-1235 (8:00am – 4:00pm PST Monday-Friday). 1. Thank you for your interest in the Codebook Chaise. The chaise lounge weighs 44.5 lbs. If you have further questions; feel free to contact us via email at: customerservice@leisuregardenfurniture.com or call us at 1-877-877-1235 (8:00am – 4:00pm PST Monday-Friday). Warranty Information:Steel Frame (3) Year-Warranted for one (3) year from the original purchase date against defects in manufacturing and/or workmanship. Aluminum Frame (3) Year-Warranted for one (3) year from the original purchase date against defects in manufacturing and/or workmanship. NOTE: Steel and wrought iron are not warranted for rust, corrosion, or rust staining. Fabric (1) Year Fabric on cushions, slings, and umbrellas warranted against separation at the seams for a period of (1) year. Fading, mildew and discoloration due to exposure to elements, chemicals, and spills are not covered. Please refer to care and maintenance information for proper cleaning instructions.